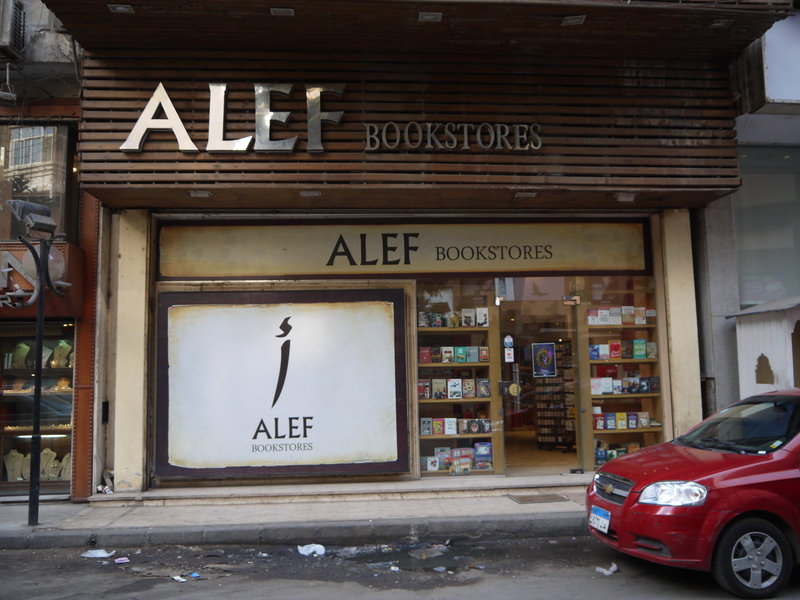 Alef Bookstores are generally easy to find with large pictures of their logo displayed prominently at street level. A recent visit to the Zamalek branch confirmed what we know about Alef Bookstores: they’re located throughout the city, often in wealthier neighborhoods; they have a wide-ranging selection of books, in both English and Arabic; the stores are comfortable and often have air conditioning and a café; and the books are organized by genre, though with all of the browsing that happens, the organization becomes a bit chaotic within each sub-section. Employees at Alef Bookstores tend to be just that, rather than the book aficionados you find at non-chain bookstores who are making a career out of bookselling and thus can offer recommendations about titles, authors, or other places to track down the book you’re searching for. That being said, with their computer system, employees at Alef can tell you immediately if a specific title or author is available at their branch or at one of the other Alef branches. If you’re looking for current and popular titles in Arabic, classic works like those by Naguib Mahfouz and Tawfiq al-Hakim, popular English-language titles, or children’s books (in Arabic and English), head to a branch of Alef Bookstores. You can also check their searchable, usually up-to-date, bilingual website before your visit, though we recommend calling to confirm a title is at a specific branch before making your way there in person. Different branches hold book signings and release parties; check the “Events” section of their website for details.